Build your leadership by running for office, organizing an electoral campaign or spearheading an advocacy effort. Organizations and individuals seek out and find women community leaders and ask them to start engaging in politics and thinking about themselves as potential candidates. AAWPI identifies young women who are potential political leaders through its State House Fellowship Program. CPPA identifies leaders through its organizing work around tenant, workers and immigrant rights. In the process, it links them to issue campaigns to introduce and promote understanding of the legislative process. Emerge Massachusetts identifies leaders through its recruitment efforts all across the state for it’s 6–month training program for Democratic women. Mass Alliance works with its 24 member organizations and local progressive organizations to identify progressive leaders who might be interested in running. Neighbor to Neighbor Massachusetts recruits potential political leaders from within its grassroots membership. 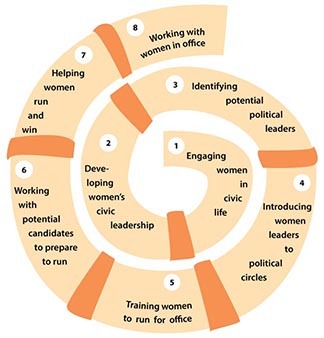 Its organizers identify women with natural leadership ability and broad progressive values. ¿Oiste? identifies leaders through its training Latinas Por el Cambio and Despierta. Suzanne Lee works on issue campaigns in the community to help identify and train women from the grassroots to become leaders.